Your spouse will tell you the truth. I’ve written about this before. There is almost no one in your life that’s going to tell you the truth. Your employees are afraid they’ll be fired. Your advisors are afraid they’ll be fired. Your business friends don’t care enough to engage in disagreement with you. There is one place besides your spouse that will tell you the truth and that is only if the group is any good. That’s a peer-to-peer group that you might be involved in. For most of us we don’t have a CEO group so it’s up to your spouse to tell us the truth. This is especially true if you’re thinking about leaving your business. Literally everyone else who’s a stakeholder will have an opinion on this that might not be in your best interest. Most of them will tell you it’s a terrible idea. Your employees will be afraid of losing their job. Your suppliers will be afraid the new owner won’t buy from them. Your advisors know that once you sell, you’re not going to be a client anymore. Your spouse will ask you the tough questions. If you want to know why, see above. Really, how many people actually take you to task for some really dumb ideas you might have? I know in my life there are very few if any who will ever take me on. It’s partly my position and partly who I am and how I live in the world. Most people who own businesses have a tough outside exterior. If you’re one of those then you know why. It helps you get through the day. And your spouse is one of the few who can pierce that tough exterior to ask you tough questions that others might be afraid to ask. Also, your spouse isn’t going to let you off the hook. At times it’s uncomfortable and it’s almost always valuable. Your spouse will ask you to tell them why this is a good idea. Have you ever had that happen with your spouse? If so, you know how valuable this feedback can be even though you hate to hear it. You need to make sure spouse understands. I know lots of times I come up with an idea and I think it’s brilliant. When I try to explain it to Suzanne she looks at me with a total lack of understanding. It’s not her fault its mine. I haven’t thought through the issue well enough to explain it to anyone else. I might have told the idea to those I work with and they don’t say anything. Because of this, I can easily think it’s a great idea and I should go forward. 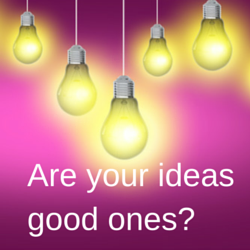 Make sure you run new ideas by your spouse. If you can’t explain it so they understand then there’s a good chance you don’t understand it either. In the end your spouse helps you to check your premises. So what does all of this have to do with buy/sell planning? I guess you could say not a lot. I would also say that when you think about selling your business you should at least talk it over with your spouse. You should explain to them why you think it’s a good idea. You should invite them to poke holes in your theories. You should explain to your spouse why someone else would want to own your business. You should see if your spouse breaks out in hysterical laughter. If they do, you might want to check your premises. Your spouse is your best partner for planning on how to leave your business. They’ll probably ask if you’ll have enough money. They might even ask you to prove that you can afford to sell. When you start planning your business exit you want to make sure you have a very tough audience during the planning stage. It’ll probably help you get a better outcome.